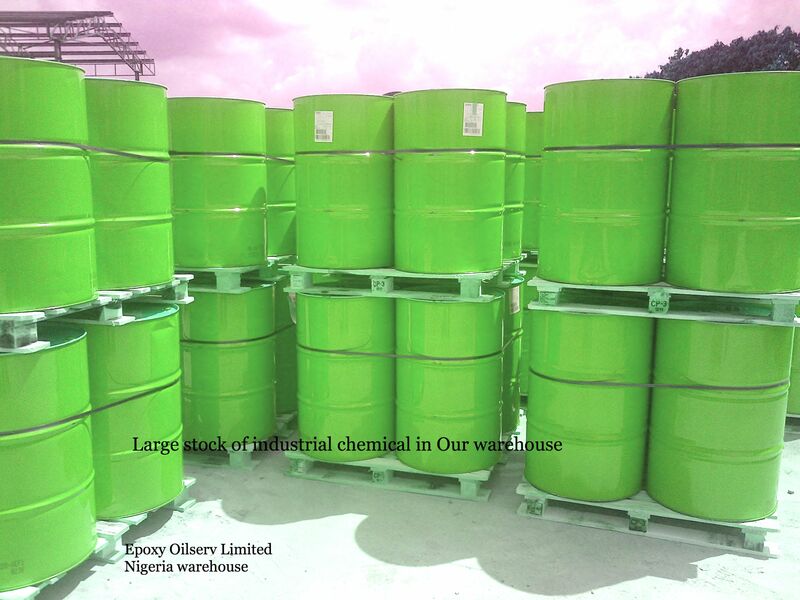 Epoxy Oilserv Limited is a Chemical Supply company in Nigeria, We are supplier of Mono-ethylene Glycol in Nigeria, we are the authorised Dealers for Mono Ethylene Glycol for most global manufacturers. Monoethylene Glycol (MEG) is a colorless, virtually odorless and slightly viscous liquid. It is miscible with water, alcohols, aldehydes and many organic compounds. MEG will not dissolve rubber, cellulose acetate or heavy vegetable and petroleum oils. MEG has a low volatility and it is 50% more hygroscopic than glycerol at room temperature. Mono Ethylene Glycol (MEG) is the most widely used chemical from the Glycol family. It is an essential raw material for Polyester fibres and Polyethylene Terephthalate (PET) polymer. MEG based products are also used as coolants in Automobile antifreeze, resins, humectants for paper etc. MEG can be transported in Epoxy coated MS tankers. It can be stored in MS containers lined with baked phenolic resin / air drying epoxy phenolic resin or vinyl resin. It is advisable to store MEG in a cool, dry place with good ventilation – away from heat, sparks or flames. Mono Ethylene Glycol is an essential raw material for Polyester. Ethylene Glycol reacts with PTA / DMT to produce polyester. Mono Ethylene Glycol and D-Ethylene Glycol is used in latex based paint formulation. These glycols are also used to produce acrylate and methacrylate resins for coatings, adhesives, and paints. Mono Ethylene Glycol is used as a reactant in the manufacture of Alkyd resins which are used in Paints, enamels and varnishes. Ethylene Glycol (MEG) is used as an active ingredient in engine coolants and antifreeze, offering benefits including a high boiling point, low vapor pressure, excellent heat transfer abilities, and the ability to depress the freezing point of water. Glycols being hygroscopic in nature are also used as Humectants for paper etc.